Almost two years ago, we saw a commercial in a movie theatre for a new car. As soon as it was over, B leaned over and said “we should get one of those.” Just 712 short days later, I agreed and went out to buy one. 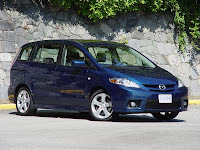 The object of her affection was the Mazda5. With three rows of seating, it appeals to families with young kids who don’t want to drive a minivan (we’re the third family at the daycare to get one this year.) It won’t win any street races, but B’s put those reckless days behind her anyway. This was the first time I’ve bought a new car, and I was a little nervous going in. I imagined these hungry sales guys viewing me like a fat chicken that’s ready to be plucked. Then I remembered that a pretty big part of my job has involved negotiating, whether it be hotel rates on tour, musician contracts, or collective agreements. So, I did my homework, considered the options, and remembered that I could always walk away if I wasn’t happy with how things were going. It’s actually a great time of year to buy a car. The dealers are a little desperate because it’s a short month and year-end is approaching. They were offering the 2007 model for $5,000 less than the 2008’s, plus a $500 Futureshop gift card and 1% GST rebate. The 2008’s have some nice improvements, but this deal was too good to pass up. We’re hoping to pick up the car tomorrow, and it will be nice to have it for our 1,400 km road trip over Christmas. Before we leave, I just have to go get snow tires for the second time in two weeks. I hope the line is a little shorter this time. Aidan sighed and said, “That’s O.K., we don’t need a Mercedes”.